Kamiakin Drama's winter production of Macbeth is just around the corner! 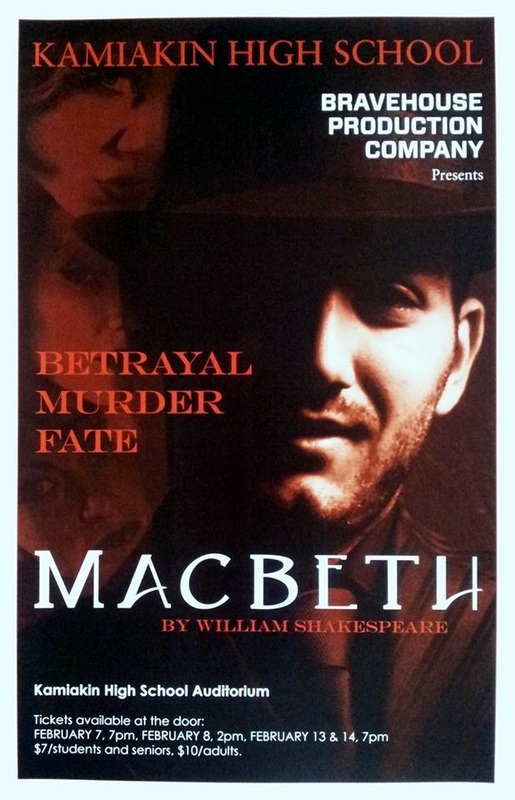 Come join us and enjoy one of Shakespeare's most famous tragedies! Performances are on Feb. 7th (at 7:00 PM), 8th (at 2:00 PM), 13th (at 7:00 PM) & 14th (at 7:00 PM). Doors open a half hour before each performance. $10 for adults, $7 for students and seniors. Tickets can be purchased at the door, cash and checks ONLY. What shows would you like to see us preform? 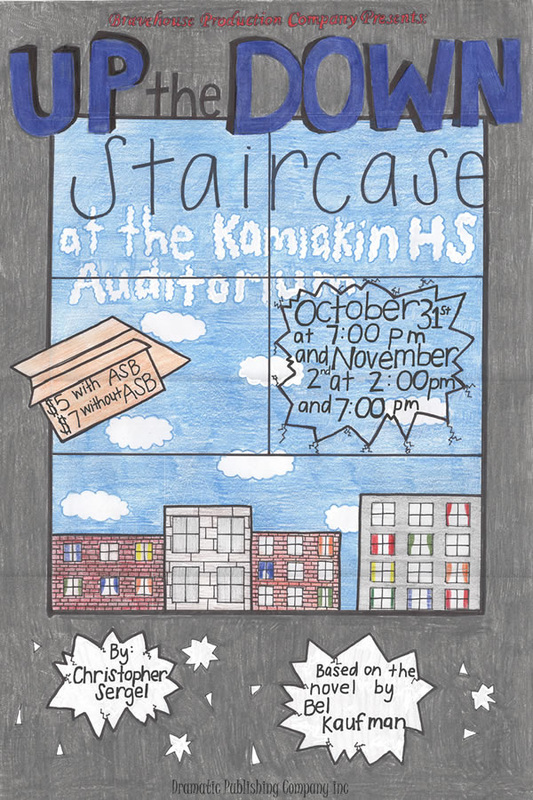 The Kamiakin Drama Club will be presenting Up the Down Staircase in the Kamiakin High School auditorium on October 31st at 7:00pm and on November 2nd at both 2:00 and 7:00pm. Kamiakin would like to welcome our new drama teacher Mr. Hamilton! Welcome back to school braves! Kamiakin Drama brought Transitive Theory and The Suessifacation of Romeo and Juliet to the CBC competition. Congrats to Billy Eshelman for winning outstanding actor! Les Mis Article in Tri-City Herald! Les Misérables Hits the Stage on Feb. 7th, 8th, and 9th! Its that time! 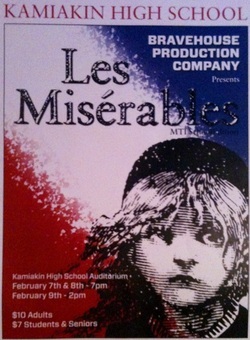 Kamiakin's winter production Les Misérables will be preformed February 7th & 8th at 7 pm and February 9th at 2 pm! Tickets are $10 for adults and $7 for students & seniors. Tickets are available at Teachers World, Whites Unfinished Furniture, True Value Hardware, or at the door! Hope to see you there! Tickets are ready. $7 students $10 adults. You can purchase them from Mrs Webb or in the Kamiakin High front office! Hope to see you there! Kamiakin Drama to preform Les Miserables! Hey everyone! Check out this reveiw from our school newspaper The Tomatalk! Hey everyone! 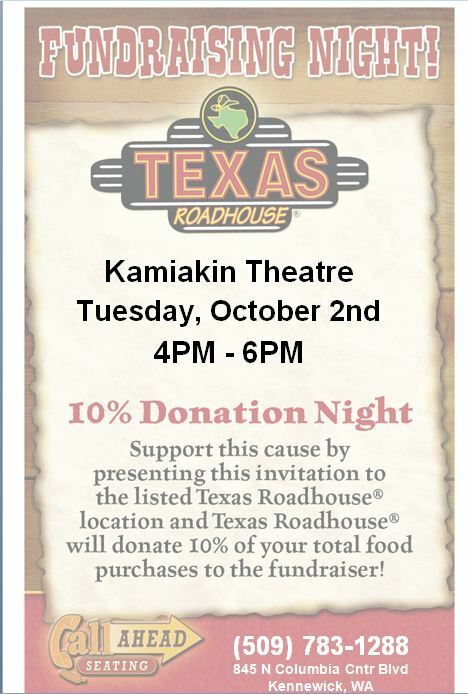 We are doing a Fundraiser with Texas Roadhouse :) If you go between 4PM-6PM on Tuesday, Oct. 2nd to Texas Roadhouse and bring this flyer with you, 10% of your meal will go to help support Kamiakin Theatre :) You can either print off the flyer from here, or get it from one of the officers! In order for us to get the 10%, you must have the flyer with you when you go. If you have any questions, please contact us through email or talk to one of the officers :) Hope to see you all there! Kamiakin Drama Gets New Adviser! Mrs. Tina Marang Webb will joining on as the next drama advisor! Looking forward to a wonderful year with her and many more to come!